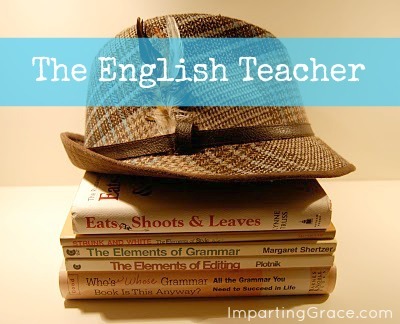 It's Thursday, so it's time for a lesson with the English teacher! Last week we talked about the use of the words its and it's. Remember: the word it's means "it is." And we never, ever use an apostrophe to form the possessive of a personal pronoun. As I said last week, I think people get confused about this because we DO use apostrophes to form the possessive of nouns. To form the possessive of a singular noun, we add an apostrophe + s. But pronouns are different. The rule for pronouns is to form their possessives simply by adding the s without the apostrophe. Here's a review question for you. Is the following sentence correct? I like to have a place for everything and everything in it's place. Answer: NO! We don't want to have "everything in it is place." The word we need is its. The possessive form of it is its. Today's lesson is similar to last week's. Several people asked me to explain once again the proper use of the words your and you're. Just like the word it, the word you is a pronoun (a word that takes the place of a noun). Once again, the rule: Never use an apostrophe to form the possessive of a personal pronoun. So the possessive form of the pronoun you is your. Your house is decorated beautifully. Could you move your car? 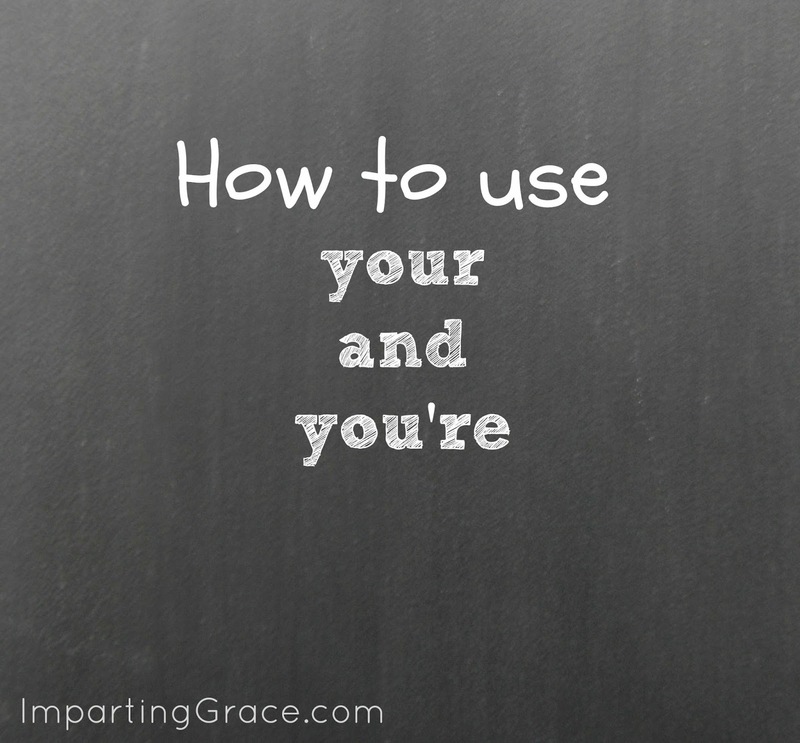 Anytime you want to indicate that something belongs to you, the word to choose is your. The word you're is a contraction of the words you are. The apostrophe replaces the omitted letter "a." So use the word you're when you mean "you are." I hope you're coming to the party. We think you're a great hostess. If you're uncertain whether to write your or you're, mentally replace it with the words you are. Is that what you mean to say? If so, choose you're. Is this (your or you're) house? I think (your or you're) the best baker I've ever met. (Your or You're) not going to believe what I have been through. If you answered your to #1 and you're to #2 and #3, you've got it! Please leave me a comment with any questions you'd like me to answer or points of grammar you'd like for me to explain. . . or even pet peeves you'd like for me to expose! 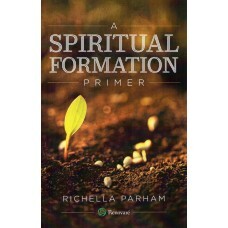 I want these little lessons to address issues that would be helpful to you. If you have a particular question you'd like for me to answer, feel free to email me (richellap (at) gmail (dot) com). I'd be happy to help if I can! I love this post...apparently I missed last week's post! English was always my favorite subject in school and I HATE when I come across errors like that in writing! We had the its/it's debate at our house this week because the font I was using didn't have an apostrophe and I refused to include the word its on our birthday invitations incorrectly! Those are some of my biggest pet peeves in reading. Have been shocked when I've read a few popular blogs who regularly use poor grammar or have lots of misspelled words. It seems unprofessional if you are using writing/communication as your craft to earn money. Just my opinion. I was blessed to have a wonderful professor in college who made us learn all of these rules, and I have been grateful my whole life since! Thank you for sharing this very important info! Thank-you for a good lesson...it's nice to have a refresher course in proper grammar. Will you please come teach my class? Could you please give a lesson on my personal pet peeve, which is adding "at" on the end of phrases such as "Where's it AT?" and "Where are you AT?"? I HATE hearing that! Thanks! It is good to have your tips posted here. I always see mistakes like this....and I have even made them myself on occasion. Have a good day Richella. I love when you revisit these grammar posts. 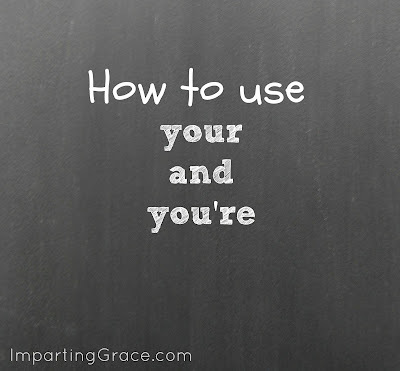 I have a grammar peeve that I never realized was a problem until I started reading blogs. Then and Than. I'm curious as to why people would get those two mixed up. Any ideas?